To dig into this a bit further, let's consider that differential amplifiers have two dynamic-range specifications corresponding to the differential-mode and common-mode signals. The differential-mode range is the maximum voltage difference that can be applied between the two inputs. Exceeding this range will have the same effect as overloading a single-ended amplifier: The output will go to the rail voltage and stay there. Because the differential-mode signal is the signal you're measuring, it's usually pretty easy to see when the differential-mode range has been violated. Amplifier gain and input attenuators will directly scale the differential-mode range. The common-mode range is the maximum voltage that can be applied to either input with respect to ground. Exceeding this range will have unpredictable results that are somewhat dependent on the amplifier design. Because the common-mode signal is what we want the amplifier to reject, it's not seen on the oscilloscope's display. Therefore, you must be careful not to exceed it. By momentarily disabling one input and connecting it to ground, the differential amplifier can directly measure the common-mode signal. In most differential amplifiers, the common-mode range is greater than the differential-mode range. However, the common-mode range is not always symmetrical with respect to ground, which means that in some amplifiers, the common-mode range in the positive direction from ground will be different from that in the negative direction. 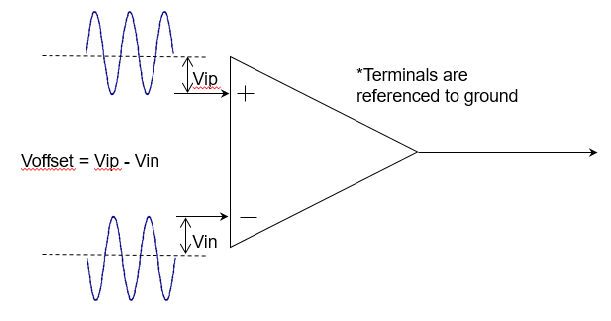 Because the common-mode component is not processed by the amplifier, the amplifier gain does not scale the common-mode range. That can be achieved with external attenuators. Let's look at some examples of voltage conditions (Figure 2) for a 25-GHz probe (specifically,Teledyne LeCroy D2505). The probe has a 1.6-V pk-pk (±800 mV) differential dynamic range, a ±4-V common-mode range, and a ±2.5-V offset range. When you select a differential probe, it's worthwhile to create a table like the one in Figure 2 (if you have some idea of the voltages you'll be probing). Say, for instance, we're measuring a signal with +1.5 V on the positive input to ground and +0.8 V on the negative input to ground. That's a difference of +0.7 V, and it's OK because it fits within our probe's ±800-mV range. What about +1 V on the positive input to ground and -1 V on the negative input to ground? That's a 2-V difference, and it's outside our probe's ±800-mV range. How about +6.5 V on the positive input to ground and +6 V on the negative input to ground? The difference is just 0.5 V, but now we've exceeded the ±4-V common-mode range. Next time, we'll talk about internal gain/attenuation for probes and the tradeoffs between gain and noise.